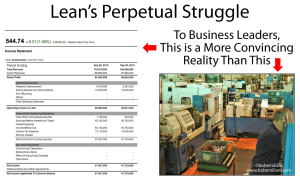 Lean transformation is often said to be difficult. But what if that is only the apparent problem, based on our perspective as people who work to promote Lean and help organizations transform from Classical management to Lean management? The difficulty clearly looks to us like a lack of understanding among managers and their unwillingness to change. But is it? 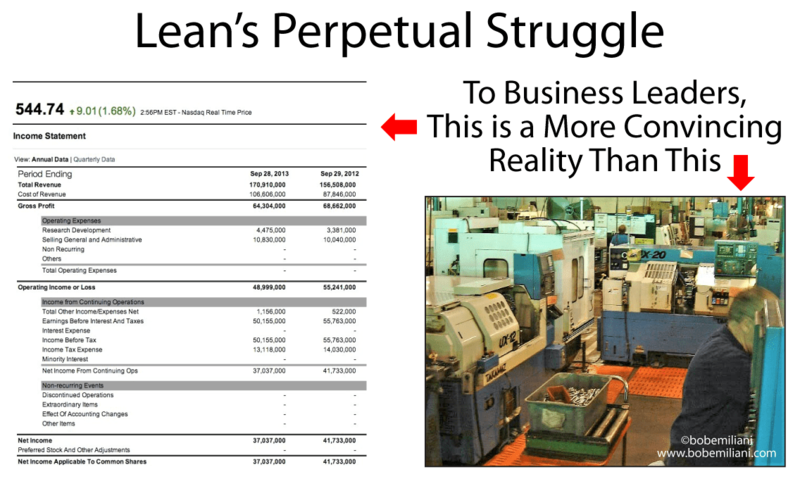 What if the actual problem is that Lean transformation is irrelevant? Executives, especially in large corporations, generally view the product or service produced as incidental to the task of making money. This phenomenon predates the modern “Master” of Business Administration degree with its focus on strategy and finance, and is actually an artifact of the transition to mass production circa 1880 (which was pre-dated by routine forms of avarice in commerce). Furthermore, executives generally view employees as a fungible asset — interchangeable with other current or future assets such as lower cost labor, software, robots, automation, artificial intelligence, etc. These two viewpoints go straight to the heart of the raison d’etre of Lean management: Improving the value proposition for customers and respecting employees (and other stakeholders). Value proposition? If business leaders could make money selling a product or service that provided zero value to customers, they would. And they come close to doing this by spending large sums of money advertising products or services whose price is 30-50 percent (or more) higher solely because of the expense of advertising. To them, selling is what generates profit, not the product or service itself. Respecting employees? As I wrote in my book, The Triumph of Classical Management Over Lean Management, “Blame and other forms of disrespect are the preferred response because they clarify and reinforce the servile basis of the manager-worker relationship.” The vast majority of leaders expect employees serve them, not vice versa. There are few notable Lean transformations because, from the executives’ viewpoint, Lean transformation is irrelevant — though management will typically require employees to use certain Lean tools as part of their work. So you see, it may not be that Lean transformation is difficult; it’s that it is unnecessary to the peculiar and specialized task of making money. That’s why it looks difficult to us. I think the most difficult part of the lean conversion is the people aspect. In other words trying to convert those who were used to a certain old way of the past. It also further enhances the difficulty in that training sessions are often necessary to operate efficiently in the new processes.